An integrated storm surge and flood inundation modeling system was developed and applied to simulate storm surges and inundation in the Gaoping River basin and its adjacent coastal area in southern Taiwan. An unstructured grid, three-dimensional hydrodynamic model was driven by the tidal elevation at the open boundaries and freshwater discharge at the upriver boundary. The model was calibrated and validated against the observed water levels for five typhoons. The results indicate a reasonable agreement between the model simulation and the observational data. A frequency analysis was used to fit the maximum surge height of historical typhoons induced by storm surges and yield the storm surge height for different return periods. 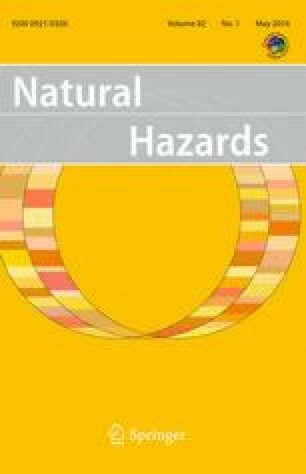 The validated model was then applied to assess the potential hazard maps for different return periods as well as the influence of the sea level rise on the potential hazard maps. The typhoon-induced storm surge under the 200-year return period matched the 200-year return period peak flow, resulting in the maximum extent and depth of inundation in the low-lying area. Furthermore, the simulated results reveal that the sea level rise would enhance the flooding areas. The inundation hazard maps developed in this study could be a useful tool for planning the evacuation of residents living in low-lying areas and the decision-making of flood risk management on the coasts and floodplains. The project was funded by the Ministry of Science and Technology, Taiwan, Grant No. 103-2625-M-239-001. The authors would like to express their appreciation to the Taiwan Center Weather Bureau and the Water Resources Agency for providing the observational data. The authors also sincerely thank two anonymous reviewers for their valuable comments.